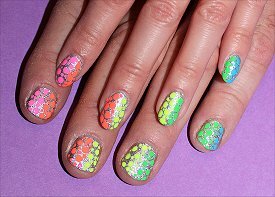 Nail Art: Neon Rainbow Dotticure…on a MAN! Since I was pressed for time, I decided that for today’s post, I would share with you something fun. Just thought the other day that it’s been a while since I’ve posted a manicure on a man. So here is the Neon Rainbow Dotticure…on a MAN! Enjoy! This entry was posted in Nail Polish on Men, Nail Polish Swatches & Reviews and tagged China Glaze, Illamasqua, OPI, Orly on January 8, 2014 by Mary S..
Nail Art Tutorial: Glitter Manicure…on a MAN! Pretty recently, I asked on Twitter if any of you had suggestions for nail-art designs to do on my friend. I got a lot of great suggestions, but I settled on a simple gradient as well as dots. Here’s the Glitter Manicure…on a MAN that I created! This entry was posted in Nail Art, Nail Polish on Men, Nail Polish Swatches & Reviews, Product Reviews and tagged China Glaze, Deborah Lippmann, Misa, Rescue Beauty Lounge on February 27, 2013 by Mary S..
Nail Art: Scotch Tape Manicure…on a MAN! 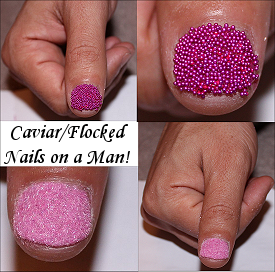 You’ve seen me paint sheep nail art, apply flocking powder, and use caviar beads on my male friend. Today, I would like to share a Scotch Tape Manicure…on a MAN! This was the first Scotch Tape manicure I’ve ever done, and I was surprised by how easy it was to do! In case you don’t know what a Scotch Tape manicure is, it’s when you use the tape as a guide to cover certain parts of your nails, so that when you remove those pieces after painting, you’re left with a nifty little design. I started painting all his nails with gold glitter. Then I applied a coat of Seche Vite Dry Fast Top Coat so we wouldn’t have to wait long for the polish to dry. I applied two pieces of Scotch tape in a pyramid position on each of his nails, and then painted the open-triangle section. I carefully removed the tape, and voila, we got the design you see! 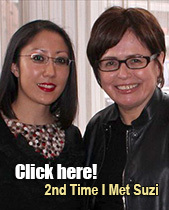 Later in this post, my own nails make a brief appearance. 😉 I couldn’t help but try a Scotch Tape manicure on myself using different colours! This entry was posted in Nail Art, Nail Polish on Men, Nail Polish Swatches & Reviews, Product Reviews and tagged China Glaze, Nicole by OPI on February 22, 2013 by Mary S..
Nail Art: Flocked Manicure & Caviar Manicure…on a MAN! There have been two extreme nail trends that I’ve wanted to try, but found them very intimidating: the Flocked Manicure and the Caviar Manicure. And, I’m pretty sure that by now, every nailphile knows about Caviar nails. 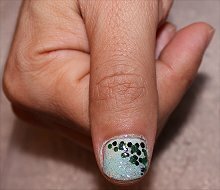 It consists of tiny little beads that completely cover your nails. You may recognize his thumb. Yup, he’s the same dude who I did freehand sheep nail art on in a previous blog post. Edit: I ended up trying a flocked manicure. Click here to see my blue flocked nails! 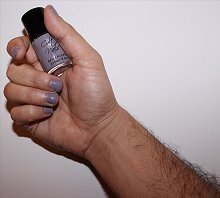 This entry was posted in Nail Art, Nail Polish on Men, Nail Polish Swatches & Reviews, Product Reviews and tagged Sina on November 30, 2012 by Mary S.. The Sheep Nail Art you see was the result of a very fun painting session! I actually had this design in my head for quite some time and had wanted to do it on my own nails, but I was just too busy. So when I was chilling with this guy, I was thrilled when he agreed to not only let me paint a sheep nail design on him, but also publish it on Swatch And Learn. Also, he wanted to confirm that he could remove it immediately after. (Haha, no, nail polish isn’t permanent!) So, just a few seconds after this little sheep was born, it was axed. Poor baby! P.P.S. I would make a terrible nail technician. The entire time, I was smiling and giggling! I just couldn’t keep quiet no matter how hard I tried. This entry was posted in Nail Art, Nail Polish on Men, Nail Polish Swatches & Reviews, Product Reviews, Tutorials & Tips and tagged China Glaze, Daniel Stone, Illamasqua, L.A. Colors, Milani, OPI on October 29, 2012 by Mary S.. 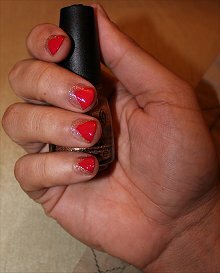 When I get bored, I often ask my male friends if I can paint their nails. Most times they aren’t willing (haha), but the rare time they say yes, I jump on the chance to go buck wild. And then I snap photos with my camera before they change their mind. I love it when people don’t take themselves too seriously and just have fun! 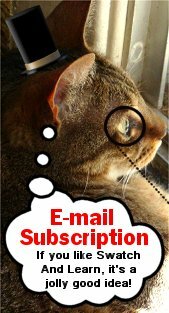 This entry was posted in Nail Polish on Men, Nail Polish Swatches & Reviews, Smorgasbord Sundays on February 12, 2012 by Mary S..